Andy Williams is a singer, who Nelson Muntz is a fan of. While on a road trip, Nelson makes Bart stop at Branson, Missouri so he can see his hero, Andy Williams. Nelson burst into tears of joy when he sang "Moon River", saying "I didn't think he was going to sing "Moon River" and then BAM! second encore!". When Bart tells Nelson's cousins that Nelson likes Andy Williams, Bart becomes their leader. "Speak Softly Love (Love Theme from The Godfather)" in "Homie the Clown"
"Moon River" in "Bart on the Road" and "Once Upon a Time in Springfield"
"Born Free" in "On a Clear Day I Can't See My Sister"
When describing people's views of Branson, he quoted Bart Simpson from "Bart on the Road", saying that Branson is "Vegas if it was run by Ned Flanders". "President Ronald Reagan was once kind enough to describe my voice as "a national treasure," and I've also had the accolade that every entertainer craves above all others: an appearance on The Simpsons. 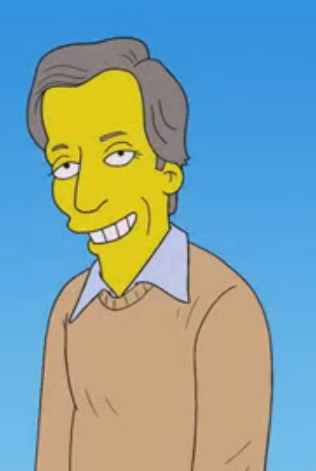 It turns out that the show's resident bully, Nelson Muntz, is an Andy Williams fan. In the episode "Bart on the Road," in which Bart obtains a credit card, hires a car, and hits the road with his friends, Nelson forces them to stop in Branson so that he can see me in concert. He then bursts into tears of joy when I sing "Moon River." To quote a tear-stained Nelson: "I didn't think he was going to sing 'Moon River,' and then BAM! second encore!"" In real life, Andy Williams passed away on September 25, 2012, aged 84. "Moonshine River" was dedicated to him. Modified on March 2, 2018, at 15:55.